The North Sea is the principal factor in the climatology of Western Europe. On the one hand, the North Sea is part of the North Atlantic Ocean and is like a big bight. On the other hand, it curves into the landmasses of the European continent. Climatic conditions are therefore transitory. Its climate is neither maritime nor continental. Nevertheless, due to its geographical location, prevailing westerly winds travelling through the hemisphere within a zone of 2,500 kilometres breadth, usually ensure a temperate humid climate. purpose, the sea needs a positive heat budget. If the heat is lost, the maritime role is diminished or gone and the seaturns continental. Further details: (A) Lost west wind drift, 2_12. In September 1939 whenthe German Fuehrer Adolf Hitler dragged the European powers into World War Two (WWII), the North Sea became a battleground. The sea was stirred and mixed from bottom to top at many places, day after day. Thisis like cooling soup by stirring it with a spoon. Cooling the sea inevitably means inviting continental conditions. 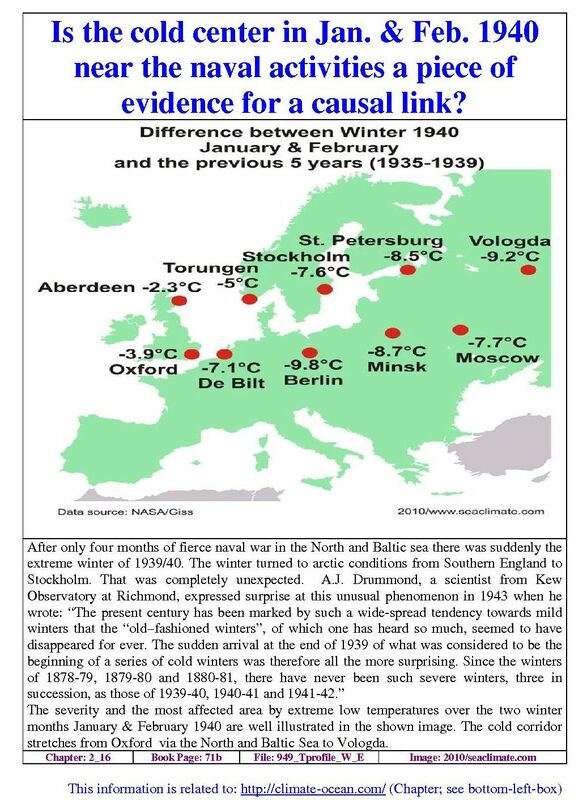 Suddenly, arctic weatherconditions penetrated into Northern Europe in the winter of1939/40. Wasit surprising? 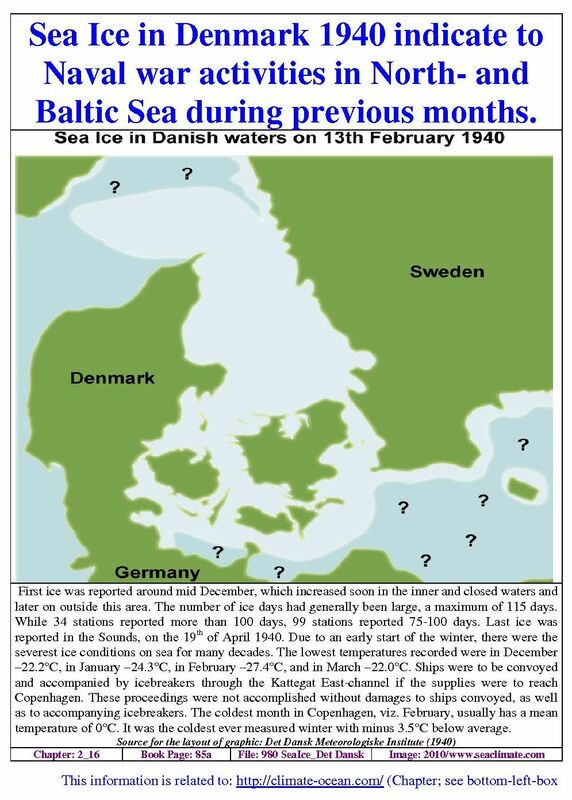 The North Sea, being a semi-enclosed sea, may hold the key to understanding reasons for the arctic winter in Northern Europe in 1939/40 and other meteorological changes that started in late 1939. The warmachinery that overran Poland in September 1939, the war activities along the French Maginot or German Westwall (A), the churning of Baltic Sea water (B), and the Russian – Finnish war at the Arctic Circle in December 1939 (C), etc may have contributed to returningEurope back into the ‘ice age’. The North Sea’s rolein this phenomenon was prominent.It can therefore be fairly concluded thattheNorth Sea, togetherwith the Baltic Sea, playedthe central role inthe emergence of severe winter conditions in Northern Europe in 1939/40, a condition not experienced inmore than100 years. Further details: (A) Rain-Making, 2_31; (B) Baltic Sea cooling, 2_17; (C) Russian-Finnish war, 2_41. There are certainly a number of factors relating to the North Sea that usually contribute to prevent Northern Europe from experiencing arctic winter conditions. The following two factorsare particularly relevant. Further details: (A) Lost west wind drift, 2_12; (B) Naval activities in late 1939, 2_13, 2_14, and 2_15. Next to the Atlantic Gulf Current, the North Sea (Baltic Sea is discussed in the next chapter) plays a key role indetermining the winter weatherconditions in Northern Europe. The reason is simple. As long as these seas are warm, they help sustain the supremacy of maritime weather conditions. If their heatcapacity turns negative, their feature turns ‘continental’, giving high air pressure bodies an easy opportunity to reign, i.e. to come with cold and dry air. Once that happens, access of warm Atlantic air is severely hampered or even prevented frommovingeastwards freely. This is a particularly serious matter during winter, when the effect of the sun’s radiation to weather processing is comparativelylow. From the above, it is clearthat the most critical months are those when the sea experiences greater heat output than heat intake. By the end of August, the North Sea would haveaccumulated its highest level ofheat intake. Animportant question pertaining to‘weather’ is how long the sea body is capable of retaining this accumulated heat.This can also be expressed in a more practical way: how long can the sea serve as acentral heat reservoirto help provideNorthern Europe moderate winters? In fact,the North Sea can and will contribute to this climatic effect, as long as it is not frozen and the surface layer of water has positive temperatures. Even during a longer cold weather period, supply of heat continues, as long as the ‘heat reservoir’ at lower water levels is not exhausted. But while the Atlantic has,during a winter season, an unlimited quantity of retained heat at hand, due to the Gulf Current, the North Sea, which is comparatively small with just an average depth of 60 metres, can store heat during summer at a very limited capacity only. From the peak heat in late August, water loses more heat than it absorbs. At the same time the North Sea holds a considerable quantity of heat to spend. It however reaches its lowest level to spend only in subsequent March, i.e. seven months after the water heat balance turns from receiving to delivering. While the status of North Sea water is important for the weather in Western Europe throughout the year, three to four months comprising autumn are of considerable importance for processing the build-up of heat for the coming winter months and for sustaining a maritime-based winter. Using this sea area for war activities during this time of the year is hardly a good idea as it may result in a cooler winter. When thousands and thousands of exploding bombs, mines and shells turn the water upside down and when hundreds and hundreds of naval vessels criss-cross the sea day and night ‘stirring’ the sea surface from one to 10 metres or more, increased release of heat is inevitable. Every depth charge could have shaken the sea body down to 50 metres or more. Every sea mine could have …and so on. Every shell could have; etc; etc. The rule is the same as applied to a hot soup. The more the soup is ‘stirred’, the quicker itcools down to the level of the surrounding air. Similarly, the stirringof seawater took place everywhere andexcessively within the North Sea realms, after major European powers were at war since the 3rd September 1939. Apart from this, any sinking ship or underwater explosion orany other military activities, whatsoever, could have turned a lot of water ‘upside down’. This‘cooling process’ needs further explanation, which will be given in the next section. Thereafter, one section will deal with seawater temperature measurements at the Helgoland observation station in late 1939. These data prove that a ‘stir’ and consequent ‘squeeze-out’ of sea heat took place. Temperatures decreased more rapidly than ever during October and November 1939 since measurements were taken. This had consequences. Along the coast from Jutland to Holland ice formed as early as mid December. A general summary will thenhighlight the main developments, which took place in the North Sea in late 1939. Finally a number of incidents indicating a ‘breakdown’ in the common temperature structure by the early arrival of winter in the North Sea area are listed in the section ‘Events’. Sea temperatures vary depending upon their depth and also in accordance with the seasons. The water depth in the North Sea can be roughly divided into two sections. The southern section comprises a plateau from Dover to the Hanstholm/Jutland – Dogger Bank - Hull/England line that is mostly less than 40 m deep. The northern section is a triangle between Hanstholm – Hull – Shetland Islands with a water depth generally ranging between 60 and 120 m (the deepest place is 263 m), and the submarine valley along the Norwegian coast with depths ranging between240 to 350 metres, although the Skagerrak, south and east of Kristiansand, is 500 – 700 m deep. Inflow of warm water from the Atlantic Gulf current enters the sea from the north and is influencing the current system from the surface to the bottom in the northern part only. The 40 m deep southern plateau is hardly affected by the northern water, but receives some Atlantic water via the Strait of Dover and freshwater from rivers. Thus the North Sea is rich withdifferent water masses, which vary seasonally and fluctuate annually. As all coastlines are subject to marked tidal forces, considerable water masses actually vary on a daily basis. In March the annual lowest mean minimum surface temperatures range between 7°C in the northwest (Atlantic water) and 4.5° in the southeast (Dutch coast). The highest mean surface temperatures at the end of August rangecorrespondingly (NW and SE) from 13° to 17.5° in the Helgoland Bight. But these few data reveal very little. What counts climatically during the important autumn period is the whole water column. During the period December to May the water body has a homogeneous temperature structure (from surface to bottom), with a decrease intemperatures in December (8-9°); January (7.5-6°); February (6.5-5°); March (6-4.5°), April (4.5-6.5°). Water veryclose to the coastlines has lower temperatures during the winter season. From May to August a horizontal thermocline builds up but declines during the autumn months. It is worth noting that while the temperature level increases at lower water levels (e.g. 20 m, 40 m) in autumn, it decreases at the bottom (60 m). It is therefore possible that the whole water body might be warmer in September than in August. While the calculation of ‘monthly averages’ is an approximate figure, it nevertheless gives an indication that the monthly decrease in temperature (or energy release) takes place in small quantities only, from 11°C in August to 4.5°C in March, i.e. on an average it could be as little as just one degree per month. A more realistic figure would be somewhere between 1°C and 1.5°C. distance ca. 650 kilometres, average depth ca. 65 m; maximum depth 120 m; belonging to the northern part of the North Sea (water body mixed with water from the Atlantic) and integrated in a current system. Due to the shallowness and tidal forces, temperature structure of the water body is homogeneous (from surface to the bottom) with small variations, as the average temperatures indicate; Dec (8.5°); Jan (6.5-7°); Feb (5.5°); Mar (5°), Apr (6.5°), suggesting that water very close to the coasts has lower temperatures during the winter season. The variations are negligible and can be ignored. Fairly homogeneous figures for the water body with 15°/16° at peak time and the lowest in March (5°), indicate that the water body experiences anaverage decrease in temperatureof about two degrees per month. It is well recorded that a positive seawater temperature series in the Helgoland Bight from 1930-39 at the Helgolandstation with WWII commencing suddenly came to an end. Goedecke dates this end at 1940-1942. Nearby light vessel “Elbe 4” on the mouth of the river Elbe records the annual anomalies as: 1939 (+0.9); 1940 (-0.7); 1941 (-0.7); and 1942 (-0.2). At bothstations seawater temperatures increased again after 1942. Goedecke attributed thisincrease in temperatures until 1940 and after 1942 to “the secular climatic changes inthe Northern Hemisphere”, resulting “primarily from the warming of the polar and sub polar atmosphere”. 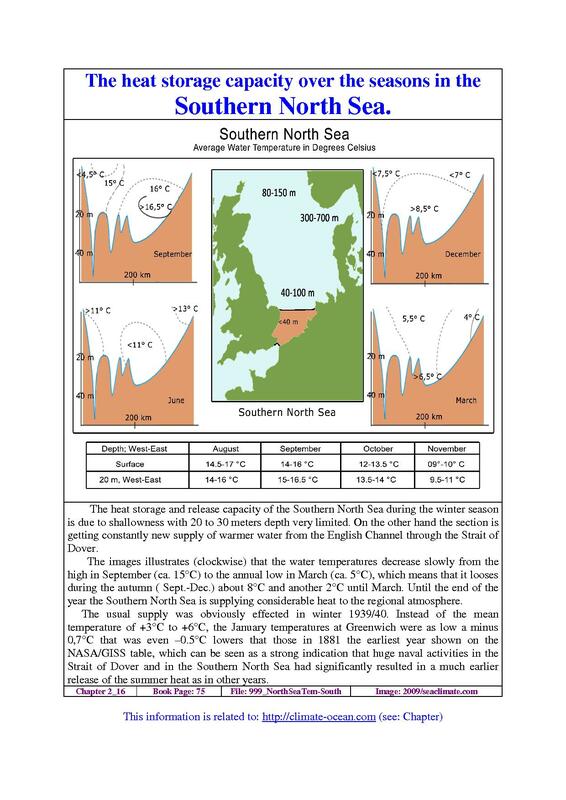 This paper’s next step is to look in detail at the figures available for 1939, showing an averageannual seawater temperature increaseof 0.9°C. The starting line will be August 1939 to prove that the war at sea, during its initial months, i.e. September to December 1939 made its clear contribution in ushering inthe arctic winter of1939/40 in Europe. Even if one is fully aware that the water masses of the German Bight (Helgoland Station) donot representthe North Sea as a whole, the differences are remarkable. The first hard fact is that August 1939 figuresofwater conditions had been in the normal range. A highfigure for a corresponding period as inSeptember 1939 had been recorded only once before, i.e. in September1875. The September 1939 figure is most likely so high because ofextraordinary naval ship movements and military activities thattook place, ‘shovelling’ lower and warmer water up to the surface. Once warmer water reached the surface, evaporation increased and subsequently seawater cooled more quickly. This becomes evident in two ways; firstly by the difference in temperaturebetween September and October, and secondly by the high deviation in temperaturefrom the previous decade by one degree in each of the months of October, November and December 1939, showing a very spontaneous and significant deviationfrom the sea climatology of the Helgoland Bight. If one can rely on the figures given by Goedecke, it can be fairly assumed thatmilitary activities were a key contributor inthe arrival of the arctic winter of 1939/40. ‘Normal’ monthly seawater temperature decrease recorded at Helgoland Station is 2.5°C from September to October, with a minor deviation (<0.4°C) over the decade since 1930. In 1939 water temperature decreasedwithin a period of onemonth from September-October by 5.7°C (normal 2.5°C; plus 3.2°C in 1939). Therefore thisbig drop requires an explanation. Further, the negative figures observed for the period October –December wouldcertainly have contributed to the surprising arrival of the cold winter. These events of‘temperature changes’ at a place where the German navy was very active, by laying thousands of minesin close by areas and the bombardment byBritish aeroplanes cannot beignored by climate watchers. Links of these eventsto ensuing winter conditions are quite obvious. Further details: (A) Late winter 1946-47, 4_21. · long duration of the icyperiod caused by two cold waves, one in January and anotherin February 1940. During the first four months ofwar no quadrant of the North Sea would have seen the same war activities as any other location might have. Considering the very basic factors, it seems reasonable to concentrate on the southern plateau section, south of the line Hanstholm/Jutland – Dogger Bank - Hull/England and the section north of this line. The southern part with its low depth and nearly homogeneous water body conditionroundthe year, saw, by far the most aggressive military activities during the early days of the war, such as 20-50,000 mines along the “Westwall” in the middle of the North Sea over a length of1,000 kms, 10,000 mines along the Dutch and English coast, hundreds ofnaval ship movements, depth charging and bombing, etc. every day. (A)However, thenorthern part saw certainly less activity, but due to the temperature structure depending onwater depths, the water body wouldoften react quite differently than in the southern part section andwith a long-term effect. Further details: (A) Sea mines, 2_14; and Depth charges, 2_15. A few words concerning the dynamics of seawater evaporation and seawater cooling: Watervapour escapes into the atmosphere only from water surfaces. The intensity of thisprocess depends on the temperature difference between the media, and also whether a certain amount of water vapour is in equilibrium with the water surface. If it is less, seawater will vaporise; if it is higher, the vapour in the air will condense and transform into clouds, rain, fog etc. In each system (water – atmosphere) the level of temperature is important. A rise in air temperature from 0°C to 10°C doubles the amount of water in the atmosphere at equilibrium. Evaporation cools a water surface by removing heat from it. As water cools, the equilibrium decreasesand the evaporation rate will decrease. Cold and salty water increasesvertical convection (water movements by sinking); warm and low salty water tends to sink less. The moreevaporation, the more the water cools. Further details: (A) Lost west wind drift, 2_12, see: “End of October 1939”, or Seewarte, 02 November 1939. · this is clearly reflected by strong temperature deviation from January – April 1940, and particularly by a long duration of the ice period (see below: Events). · the emergence of the first visible sign of cooled down seawater (icing) can be delayed by the continuation of the ‘mixing’ of water. All these criteria are clearly reflected in the sea surface data from Helgoland for the winter period of 1939/40. These main results can be fully applied for all of the southern part of the North Sea, south of the Hanstholm/Jutland –Dogger Bank - Hull/England line, even taking into account, that the Helgoland Bight particularlyhad been highly exposed to naval activities. Northern North Sea: The forced ‘stirring and mixing’ situation of the water body in the northern part is much more diverse and intensethan in the southern part during autumn. A naval activity that may force the cooling of the sea surface layer in September may, by similar activity increase evaporation in December, or may bedoing both actions at the same time. On the other hand, a stirring and mixing within the upper water layer down to 10 or 20 metres in early autumn will, just as it does in the southern section, actively support an accelerated evaporation process in September and October. But speaking in general terms, a military activity-forced mixing in autumn will move warm water to agreater depth, thereby extending the retention ofthe amount of stored heat by weeks or even months. It should not be regarded as too big a surprise, if the northern section of the North Sea may have even contributed with a release of more heat into the air during the later partof the winter of 1939/40than during other years. 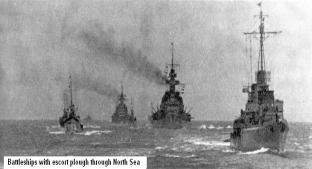 Since the day the Second World War had started naval activities moved and turned the water in the North Sea at surface and lower levels at 5, 10, 20 or 30 metres or deeper on a scale that was possibly dozens of times higher than any comparable other external activity over a similar time period before. Presumably only World War One could be named in comparison. The combatants arrived on the scene when the volume of heat from the sun had reached its annual peak. Impacts on temperatures and icing are listed in the last section: ‘Events’ (see below). The following circumstantial evidences help conclude with a high degree of certainty that the North Sea contributed to the arctic war winter of1939/40. Further details: (A) Violent weather, 2_52; (B) Russian-Finnish war (2_41. Water, among all solids and liquids, has the highest heat capacity except liquid ammonia. If water within a water body remained stationary and did not move (which is what it does abundantly and often forcefully for a number of reasons), the upper most water surface layer would, to a very high percentage, almost stop the transfer of any heat from a water body to theatmosphere. However, temperature and salt are the biggest internal dynamic factors and they make the water move permanently. The question as to how much the ocean can transfer heat to the surface depends on how warm the surface water is relative to atmosphericair. Of no lesser importance is the question, as to how quickly and by what quantities cooled-down surface water is replaced by warmer water from sub-surface level. Atmospheric factors responsible for exposing quickly new water masses at the sea surface arewind, cyclones and hurricanes. Another ‘effective’ way to replace surface water is to stir the water body itself. Navalactivities are just doing this. More wind: As the rate of evaporation over the North Sea hasnot been measured and recorded, it seems there is little chance to prove thatmore vapour moved upwards during autumn 1939 than usual. What can be provedis that the direction of the inflow of wind had changed from the usually most prevailing SW winds, to winds from the N to E, predominantly from the East. At Kew Observatory (London) general wind direction recordedwas north-easterly only three times during 155 winter years; i.e. in 1814, 1841 and 1940. This continental wind couldhave significantly contributed to the following phenomena of 1939: ‘The Western Front rain’ (next paragraph). Further details: (A) Rain-Making, 2_ 31. More cooling: Further, coolingobserved fromDecember 1939 onwards can be linked to war activities in two ways. The most immediate effect, as has been explained (above), is the direct result from any excessive evaporation process. The second (at least for the establishment of global conditions in the first war winter) is the deprivation of the Northern atmosphere of its usual amount of water masses, circulating the globe as humidity. The less moist air is circulating the globe south of the Arctic, the more easily cold polar air can travel south. 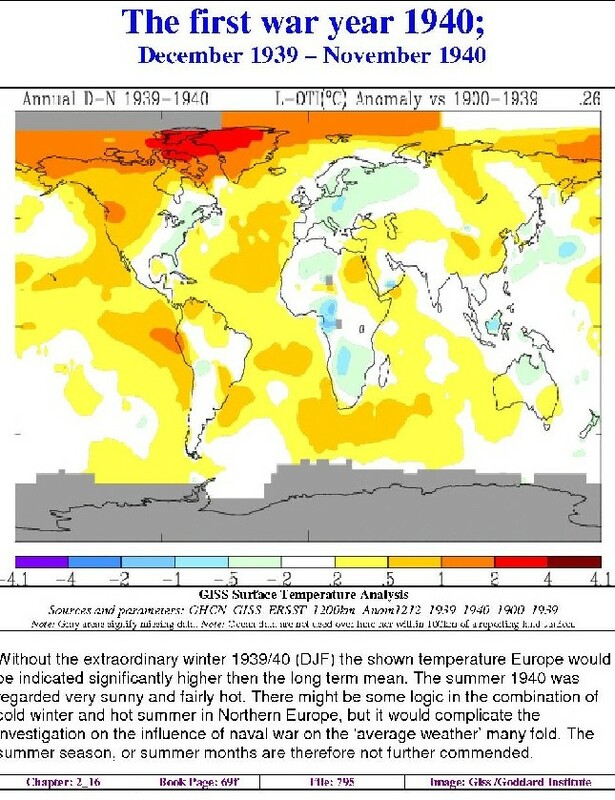 A good piece of evidence is the record lack of rain in the USA from October – December 1939 (A), followed by a colder than average January 1940, a long period of low water temperatures in the North Sea from October-March (see above) and the ‘sudden’ fall of air temperatures to record low in Northern Europe. 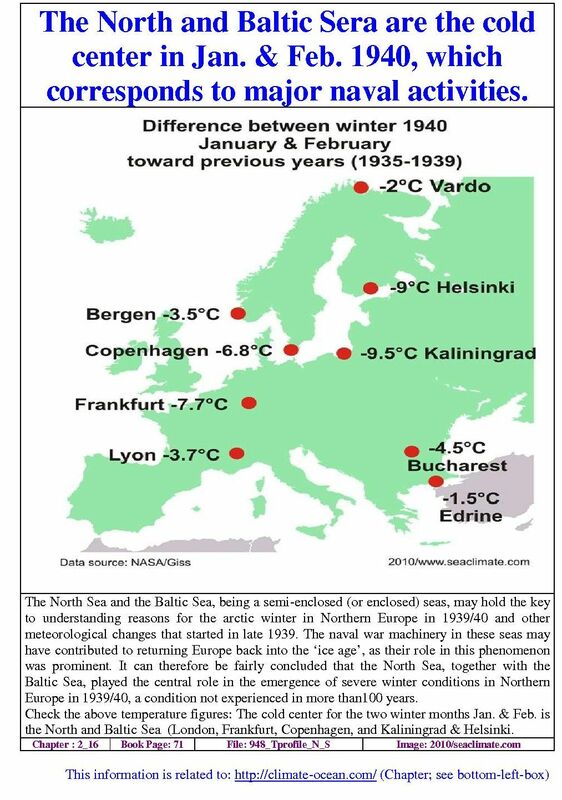 Climatic conditions in the North Sea in autumn 1939, together with those ofthe Baltic Sea (B), played a key contributoryrole in sustaining the coldest winter in Northern Europe for more than 100 years. Further details: (A) USA dried out, 2_32; (B) Baltic Sea cooling, 2_17. The following listdoes not give a full picture of events but only points to some major events, places and impacts reported. 11 December 1939; Helgoland reported frost on December 11 and December 13-19 (from December 14-18 meantemperature of -1,6°C; December 15, mean temp. -3,6°C; lowest December 16, – 4,5°C; and frost from December 26-31. 16 December 1939; Ice on river Elbe, (e.g. Glückstadt, Hamburg), remained continuouslyfor more than 90 days until mid March, 1940. 17 December 1939; Tönning (near Husum) reportedfirst ice, which remainedfor 100 days. Note: Before icing commences along the German North Sea coast, the air temperature needs to be below zero for about 4 to 5 days. 17-21 December 1939; Almost all observation stationsalong the German coast from Nordstrand (island south of Sylt and Amrum) to Borkum report the emergence of sea ice,itsstay in the south ca. for 60 to 70 days, and further north ofCuxhaven for 70 to 102 days12. North of Husum (Amrum, Sylt) ice remained from early January for approx. 60 days. 29-30 December 1939; During the night of29/30 a strong southwest storm swept through Helgoland Bight (Helgoland up to 11 Beaufort)13. At the same time in far East Germany (East Prussia) very cold air ofmore than -20°C, had been blowingfrom the North and pushing further south14. 2 January 1940; Esbjerg – soft or new ice, navigation not hindered, Danish light buoys werewithdrawn over the next 10 days16. 6 January 1940; Drift ice in the East Scheldt. Ameland temporarily cut off from the mainland by ice. river Maas is frozen over from Woudrichem to Heusden17. 14 January 1940; Drift ice on river Scheldt reported to have torn buoys from their mooring18. Frankcom made the following comment justa few dayslater: “in these nine days conditions have deteriorated very rapidly and one sees the first real indication of somewhat abnormal conditions, most particular isfreezing of rivers Scheldt and Maas”. 20 January 1940; Difficulties due to icereported in the river Scheldt20. 21 January 1940; Heavy ice drift reported on thewest Scheldt 21. 27 January 1940; Helgoland hadice for 10 days between January 27 and February 2324; duration of ice formation inHelgoland is11 days25. 28 January 1940; In the close vicinity of London river Thames hadbeen frozen for the first time since 1814. (Neue Zürcher Zeitung, 29 January 1940). 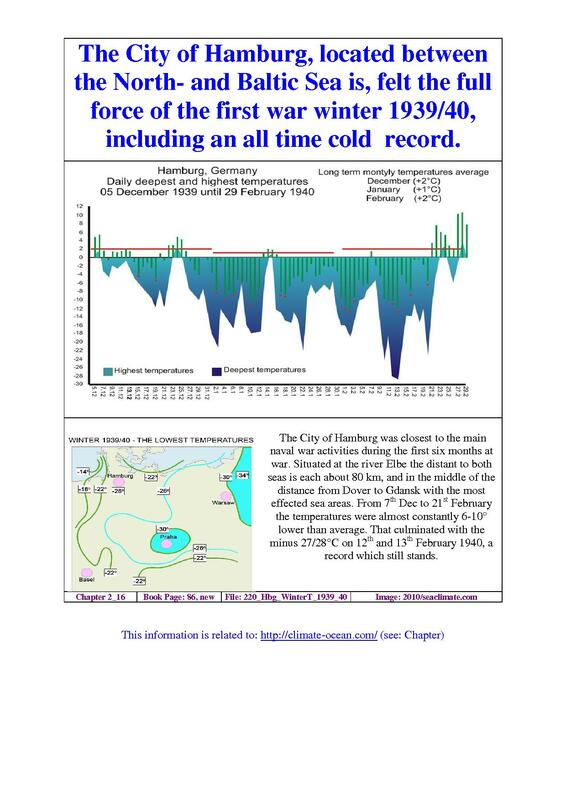 Remark: It should be noted that January was colder in Emden than in Westerland, which ranks first in February, a fact that could support the thesis that war activities in the northern section of the North Sea, delayed cooling of the sea (see previous chapter). Further details: (A) Winter 1939/40, 2_11.